Today’s update to Direct Mail brings a variety of bug fixes and enhancements, but one of the most noticeable changes will likely be the improvements to the Reports user interface. Since most of our customers (and most Mac users, in general) are accessing Direct Mail from their laptops, we optimized the Reports tab to make the most of limited screen real estate. As shown in the animation above, you’re able to see much more of your report in version 3.5.3 as compared to previous versions of Direct Mail. 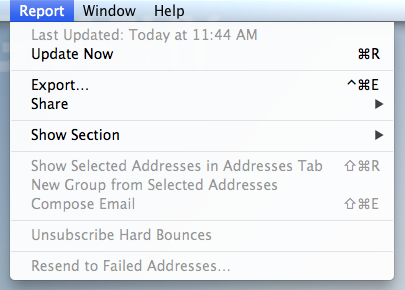 We’ve also added a Report menu to the menu bar for easier access to features you may not have realized existed before. As always, you can learn more about the rest of the changes in Direct Mail 3.5.3 by reading the release notes. Follow us on Twitter or Facebook for more updates in the future!